Poached pears in wine (or Poire à la Beaujolais) is a classic French dessert that originated in the wine growing territories of Burgundy and Lyon. The French used it as a way to consume fruits that were not ripening to their liking on the tree. By combining peeled pears with wine and a bouquet of spices, the people of the region were able to maximize their harvest while creating a dish that highlights the fruit's natural sweetness. 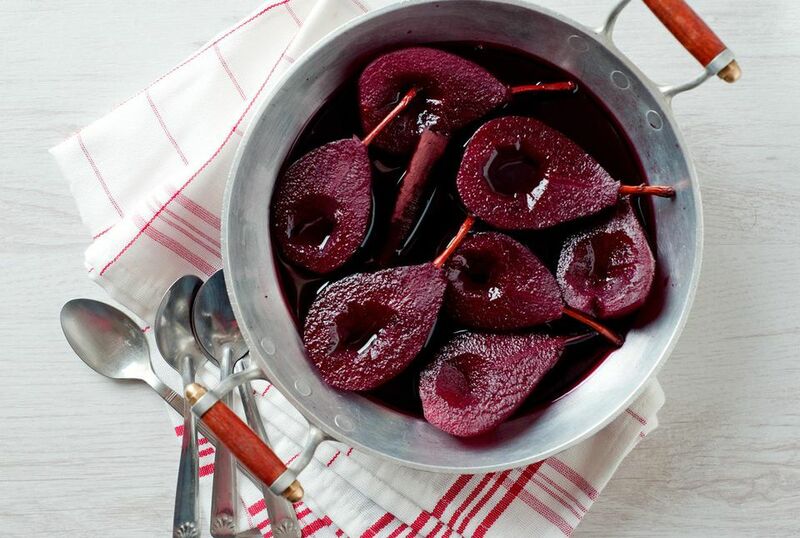 This poached pears in red wine recipe offer a warming dessert option for a cold winter night or an elegant brunch dish for a family get-together. Select a fruit-forward red wine for this ensemble. And pair it with your favorite spiced tea or serve it next to a dollop of artisanal vanilla ice cream topped with homemade whipped cream. The presentation lends a translucent look to the fruit, infused with red undertones. It's a decadent dessert that will impress your guests and won't overpower the dinner spread. Fill a bowl with water and add the lemon juice, reserving 2 tablespoons. Peel and core the pears (with an apple corer); place them in the bowl of water to rest. Combine the red wine, sugar, 2 tablespoons lemon juice, zest, vanilla extract, and cinnamon in a medium saucepan (big enough to house the pears) and bring to a boil. Turn the heat down to achieve a low simmer. Add the pears. Simmer the pears for 10 to 12 minutes on one side. Rotate the pears and continue to poach them for an additional 8 to 10 minutes, or until they are tender and are easily poked through with a fork. Remove pears from the pan and cool them on a slatted rack or old, clean towel. Bring the wine sauce back up to a rolling simmer and cook until the liquid has been reduced by half. Place one pear into a shallow bowl. Pour a stream of sauce over pear. Place one scoop of ice cream, mascarpone cheese, or crème fraiche next to the pear. Garnish with fresh mint leaves or dark chocolate shavings. For a twist on this elegant French dessert try this classic poached pears in white wine recipe or chocolate-dipped Poires Belle Helene—a dish created in the 19th century by French chef Auguste Escoffier and named after an opera.